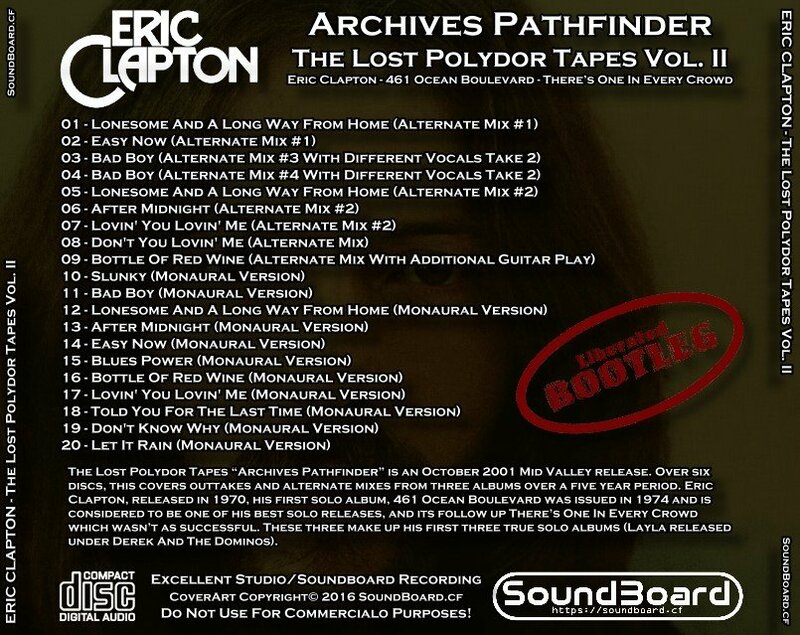 The Lost Polydor Tapes “Archives Pathfinder” is an October 2001 Mid Valley release. Over six discs, this covers outtakes and alternate mixes from three albums over a five year period. Eric Clapton, released in 1970, his first solo album, 461 Ocean Boulevard was issued in 1974 and is considered to be one of his best solo releases, and its follow up There’s One In Every Crowd which wasn’t as successful. These three make up his first three true solo albums (Layla released under Derek And The Dominos). This set is authoritative simply because, despite the list above, titles with Clapton studio outtakes are very rare, unlike title for The Beatles and The Rolling Stones which are simply out of control. Archives Pathfinder is the only comprehensive collection documenting any time period of his career. And the sound quality is uniformly excellent for all the volumes. Vol. 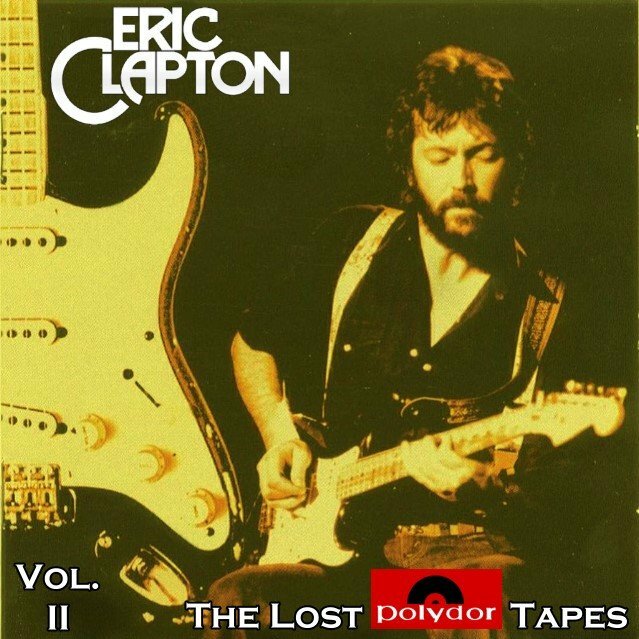 II = Outtakes and Alternate mixes Album "Eric Clapton"
Eric Clapton is the eponymous debut solo album released in August of 1970. Recording started at Olympic Studio in London in 1969 right before he toured with Delaney and Bonnie in Europe. Five songs, “I’ve Told You For The Last Time” (with eight takes), “Lovin’ You, Lovin’ Me,” “I Don’t Know Why,” “Where There’s A Will There’s A Way” and “She Rides” were recorded. Only one track from this session, “Lovin’ You, Lovin’ Me” actually made it onto the album. Sessions for Eric Clapton continued in Los Angeles in January 1970, and contributed the rest of the album. Eric Clapton was mixed three times. Delaney Bramlett did the first mix in LA. According to Clapton: “I left the tapes in LA with Delaney to mix them, and he was waiting on me to finish one of the tracks! And he didn’t realize that I was waiting on him to mix the tracks and send them over. Finally, my manger got kind of impatient and told Atlantic to send the tapes to me, and I mixed them very badly. Atlantic heard them, didn’t like ‘em. Then they sent them to Tom Dowd who mixed them again. So they were mixed three times in all. Naturally I never heard Delaney’s mixes until it was too late – the record was already out.” The version that was released on LP in August 1970 is thus the Dowd mix. The first half of disc one is occupied with the Bramlett mix. This includes all the tracks that would subsequently be officially released on disc two of the 2006 Eric Clapton deluxe edition. The Bramlett mix of “After Midnight” was also officially released in the Crossroads box-set in 1988. In general, the Bramlett mix emphasises the rawness of the guitars and adds more echo to the vocals. The horn section is also given more place in the arrangements and all of this contributes to a heavier “live” sound compared to Dowd’s. The sound quality on Mid Valley is excellent. It is also unedited, leaving in some of the studio chatter edited out of the official release. A prime example of this is “Blues Power,” which is forty seconds longer on Mid Valley with a short piano introduction. The next five tracks, “Bad Boy,” “Lonesome And A Long Way From Home,” “After Midnight,” “Lovin You Lovin Me” and “Don’t Know Why” are all listed as “original long version.” These are all identical to the Dowd mixes found on the official release but with longer fades. The rest of disc one, and the first half of disc two, contains alternate mixes from the Bramlett Eric Clapton. The only interest is in the volume and placement of the horns. Some have more, some less. The most interesting of the lot is ”Bottle Of Red Wine,” the “alternate mix with additional guitar play.” It is actually shorter than the official version, but it has another guitar line in the mix that was omitted from the final product. Its omission doesn’t significantly altar the arrangement, but it is a nice variation of the well known song. The last part of disc two contains Eric Clapton in mono. Two more Eric Clapton outtakes appear on disc six of this collection for space reasons. “I Don’t Know Why” is from the the November 1969 sessions in Olympic Studio. Lasting five minutes, the gospel tune is much more lush than the other version. “Blues In A – Instrumental Blues Jam” is a ten and a half minute slow instrumental blues in the key of A, and it is interesting since it foreshadows the long blues improvisation Clapton would includes on subsequent tours. It was officially released in 1999 on The Blues on a rare bonus discs available only with early pressings. Both of these songs would be included on the 2006 deluxe edition. Polyor, in addition to those two tracks, included the November 1969 Olympic recordings of “I’ve Told You For The Last Time” and “She Rides.” The official version of “I’ve Told You For The Last Time” is a two and a half minute ditty, but the Olympic Studio recording is an almost seven minute long epic blues, masterful in construction and deserving of release. “She Rides” is an early take on “Let It Rain” with the same melody and chords but slightly different lyrics. Those two, plus several Delaney and Bonnie tunes make the deluxe version worth having in addition to the Mid Valley. The Lost Polydor Tapes Vol. II 0 out of 5 based on 0 ratings. 0 user reviews.